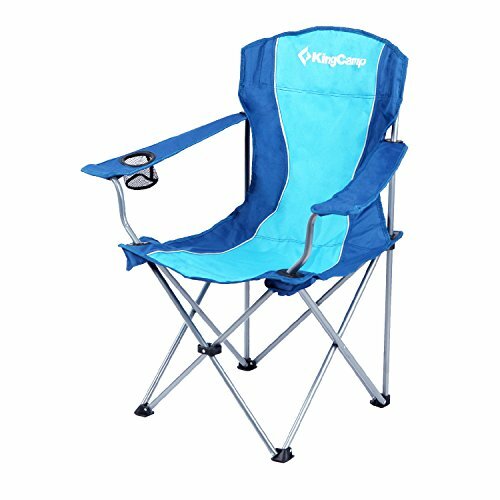 KingCamp lightweight portable strong stability folding deluxe camping chair is perfect to be used indoor, you can also bring it to outdoors activities for picnic, camping, beach, patio parties and fishing. The weight is 6.2 lbs and the size only has 35.5 x 6 x 4 inches after folded, which make the chair portable and light enough to be carried like a small luggage on a trip. The size of the chair (33 x 20 x 37 inches) make it is big enough for a big guy and the chair with 600 x 300D oxford fabric which is comfortable and gives you a cozy body feeling. With a cup holder you can keep your drink close. Delicate and soft armrest is convenient to have a rest. High strength steel tubes bracket structure design makes it very stable, clamping slot type and wear resistant Oxford cloth make it firmly, support up to 265 lbs. ❤THE RIGHT SIZE: The size of the chair (33 x 20 x 17 / 37 inches) is big enough for a big guy and the chair with 600 × 300D oxford fabric is comfortable. ❤CUP HOLDER AND ARMREST: With a cup holder you can keep your drink close. Delicate and soft armrest is convenient for you to have a rest. ❤EASY TO OPEN AND FOLD: The chair is easy to open or fold in seconds when you need to use it at anytime and help you save much time. ▲FIRM AND DURABLE: High strength steel tubes bracket structure which is stable, card slot type and wear resistant oxford cloth makes the chair firmly, support up to 265 lbs. ☂LIGHTWEIGHT AND PORTABLE: The weight is 6.2 lbs and package size is 35.5 x 6 x 4 inches, which make the chair portable and light enough to be carried like a small luggage on a trip. Portable zipper carry bag with handles is easy for transportation and storage. If you have any questions about this product by KingCamp, contact us by completing and submitting the form below. If you are looking for a specif part number, please include it with your message.